Welsh music and poetry from the 14th to the 18th Century. The first Welsh crwth recording (2001). Kaniad y gwynn bibydd / Caniad of the White Piper (extract), Robert ap Huw ms.
2. Mae Gen i Chwaer Mari / My Sister Mary, first verse and tune, Caneuon Llafar Gwlad. D. Roy Saer, second verse; hen bennill /a traditional verse. 3. Ffoles Llantrisant / The Foolish Girl of Llantrisant, coll. by Maria-Jane Williams, bap. 1795 - d. 1873, The Ancient National Airs of Gwent and Morganwg. 4. 'R Adar Bach / The Little Birds, tune from Canu'r Cymry, Phyllis Kinney and Meredydd Evans, text; a selection of hen benillion / traditional verses. 5. Childgrove, from John Playford's The English Dancing Master, (17th century). Kaingk Dafydd Broffwyd / Cainc of David the Prophet, Robert ap Huw ms. ('Musica'). c.1613. Br. Mus. Add. MS 14905. 7. Caseg Felen / A Brown Mare, Canu'r Cymru II. P. Kinney and M. Evans. 8. Myn Mair / By Mary, from the song book of M. Evans, MS LIGC Fac. 7, Canu'r Cymru. 9. Siglo'r Crud / Rocking the Cradle, words, hen benillion / traditional verses. Tune, Cerdd Hen Ŵr y Coed from Gems of Welsh Melody by John Owen. 10. Untitled Ballad by Richard Hughes, Mostyn mss, 9. 16th - 17th century. As I Went to Walsingham, anon.16th century ballad tune. 11. Ys Daeth Crist / And Christ came (extract), Dafydd Ddu Athro (early 14th century). By kind permission of Prof. Geraint Gruffudd. Gosteg Dafydd Athro / Gosteg of David the Master (extract), by Dafydd Athro (fl . 1385-1430), from Robert ap Huw ms.
Bragod, a word denoting a mingled liquid e.g. the sacramental wine and water, also the mingling of fl ats and naturals to create the scales and modes of medieval Welsh music. The duo is dedicated to the reunion of Welsh medieval high-art poetry (cerdd dafod) and with Welsh string music of the period (cerdd dant) after centuries of separation. While the poetry of the period has been closely studied, the Welsh music which elevated and added splendour to the performances has long been presented as mystery. Robert ap Huw's manuscript (MUSICA, British Museum Additional Manuscript 14905 (c. 1613) contains a considerable body of medieval string-music in a distinctive Welsh style, composed on precepts markedly different from other contemporary European artmusic. The pieces date from the 14th -16th centuries, written in an unique tablature for the harp. This manuscript is the prime musical focus for Bragod. In medieval Wales only the crwth and harp were deemed suitable instruments to accompany the voice in performances of high-art poetry and many poems would have been accompanied by the crwth alone. High-art poetry and music in medieval Wales were created for kings, clergy and gentry. A long, formal apprenticeship ensured that poets, harpers, crowthers and solo singers who specialised in working with them (datgeiniaid) met carefully graded professional standards. The grades attained determined the fees they could charge for their work. Apprentices were subject to examination, often in public (eisteddfod), by established masters. The twenty four measures of string-music are binary patterns which form a compositional basis, an analytical tool and a mnemonic system. Both poetry and music were orally transmitted, the great bulk of poetry only being written down in the 15th century and a minute part of the musical culture in the 16th and 17th centuries. 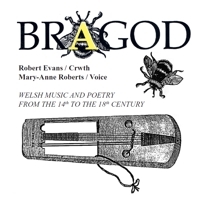 Bragod combines the tone of the crwth with a voice developed to complement and shine through the tone of the crwth while honouring the unique sound-play of medieval Welsh poetry. Since Robert ap Huw's tablature is written for the harp, much thought and experiment have been necessary in order to present it idiomatically, on the crwth. The crwth, which combines bowed and plucked sounds, weaves a close yet subtle texture. The duo takes an historically-informed approach to the music: using facsimiles of the manuscript, carefully reconstructed instruments and Pythagorean intervals. They leapfrog back to the middle ages avoiding the modern conventions used to set Welsh poetry to music (canu penillion) with its 17th - 19th century origins. The duo experiments with wordsetting, ranging from a syllable-per-note approach to elaborate melisma. Bragod recreates a sound-world which may challenge medieval music specialists and modern traditional Welsh musicians. As a contrast to the formal medieval repertoire the duo performs 16th and 17th century ballads in Welsh, written to be sung to European tunes in the Renaissance style – the style which was to usurp the formal Welsh style in music and poetry - and also examples of Welsh ritual and popular music from the 18th century. Robert Evans was born in North Cardiganshire. His research on the Robert ap Huw Manuscript and Welsh medieval musical instruments began thirty years ago and is the foundation of Bragod's work. He has contributed articles to organological and musical journals and to the New Grove Dictionary of Music and Musicians on the crwth and on medieval Irish, Welsh and European harps. Mary-Anne Roberts trained in Performance Arts in her native Trinidad and Tobago where she enjoyed a successful career in theatre and television before migrating to the U.K. After a period of familiarisation to the sound of the crwth, she began concentrating on historical Welsh music and has performed with the instrument since 1999. Robert Evans and Mary-Anne Roberts are members of the trio Lyrae Cambrenses in which they are joined by historical harpist Bill Taylor. A crwth made by Gerard Kilbride is played on tracks: 1, 4, 6, 10 and 11, this is tuned: ГG, cC, Dd. A crwth made by Don Tatem is played on tracks: 2,3,5,7 and 9, tuned: FF F, bbBb, Cc. Edited and produced at Albany Studios, Cardiff. Crwths made by Gerard Kilbride and Don Tatem, Cardiff. Special thanks to Cindy Ward, Morgen Hall, Rob Kennedy and Sarah Roberts.